As patients, we rely on pharmacists to accurately provide us with the medication our doctor has prescribed. Often, the medication is critical to our continued good physical or mental health. But, if the pharmacist makes a mistake, the results can be devastating. And, pharmacists do make mistakes. In fact, according to the National Patient Safety Foundation, for every 3 billion prescriptions filled, 30 million are filled inaccurately often causing serious injuries and even death. Pharmacy errors typically fall into two categories: (1) the wrong medication is provided or (2) the wrong dosage is provided. At The Law Offices of John Day, P.C. we have been privileged to represent clients who were injured as a result of pharmacy errors by both national chains as well as local pharmacies. If you believe you have been the victim of a pharmacy error, you should immediately consult with both your doctor and your pharmacist to: (1) get advice on how best to handle any potential complications or side-effects and (2) advise them of the error and document it occurred. Next, be sure to keep as evidence the prescription bottle and any literature provided by the pharmacy. Do not return the medicine to the pharmacy and do not throw it away. Then, contact one of our experienced injury attorneys to arrange for a free, no-obligation consultation. From our experience in handling these types of cases, we have discovered there are a few steps you can take that may help you from becoming a victim of a pharmacy error. If possible, do not get your prescriptions filled at the beginning of the month. A lot of elderly patients are on a limited budget and have to wait until their Social Security checks arrive before they can refill their monthly prescriptions. As a result, pharmacies are generally the busiest at the beginning of the month. An overworked and harried pharmacist is simply more likely to make a mistake. For similar reasons, try to avoid getting your prescription filled on a Monday as it is typically the busiest day of the week for pharmacists. Once your prescription has been filled, take a moment and look at it. Is it as described on the literature received with the prescription? 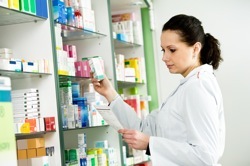 If not or if it is a refill and looks different from normal, follow-up with the pharmacist. Periodically, check to make sure the pharmacy's records reflect your current medications so that any interactions can be identified. If you would like to speak with one of our experienced and reputable injury attorneys about a potential claim, please contact us online or call us at 615-742-4880 or 866.812.8787.